NATPA of NE Home Page! Sargent is still having there pull. It starts at 12:30. Hope to see you there. Looks like we are about ready to start the 2005 pulling season! We have ten pulls so far this year. Check out the 2005 Schedule for the pulls and dates. There was some talk at the meeting in Kearney about getting a few pulls added in the eastern part of the state. We will be running DIV I, II, III, IV, V and the Platte Valley's poor mans V. This should give everyone a class to pull in. See YA! at the pulls. Some time I deleted my contact information from this page so I'd better get it back up. mmpulling@yahoo.com Please would the new board members send me an e-mail so I have your e-mail address along with you home address and phone number for the officers page. 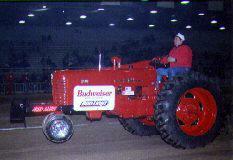 Remember the championship pull is 9-17-04 at Gothenburg it will start at 5:00pm. If you have any questions please call Wayne Johnson at (308) 749-2276. I don't have any information on the points. Sorry!!! The 2004 Schedule is updated! I still need some information to finish the officers page. I just learned last night that Stapleton will be able to have there PVTP points pull July 4th at 10:00 am central time it is not an NATPA of NE pull. It will be div I, II, and III only. Please excuse me on not getting this site up dated I had some major problems getting into this account and finally got that fixed tonight. I have been unable to get into this account for over two months. As soon as I get the news letter for the information I'll get the pages up dated. The summer pulling season is almost here. Sargent will start this years pulling season on Sunday June 6th at 12:30. Please come early and hungry there will be a pancake feed starting at noon. Try your hand at Pit Spitting & Horseshoes at 1:30 if you like. We are going to charge $15 for the first hook and $10 a hook after that so bring two tractors or three and pull three or four times or more. This year we will pull all of the divisions div I, II, III, IV, V and the new division see below for rules. Same location as last year should easily be found if you drive down main street. As far as I know this is what we are doing for div IV and V. Sargent will be this way for sure! I'm sure there are some questions on rules and some changes that were made at the annual meeting, we voted to do away with the combined div IV and V and go back to the the old DIV IV and V rules. I'll try to get the rules updated but untill then go to NATPA.com for the Div IV and V rules. We had some interest in a class between DIV III and DIV IV and added a new division which uses DIV V rules with DIV II's tire size, 30% over stock RPM, 3000 RPM max limit. If you meet div II's tire size and are DIV V legal you are legal in this new class. The news letter should be coming out shortly when I get it I'll be able to up date the schedule page and officers page. I'm sure some of you have noticed that the random picture at the top of this page is not working. Something to do with the hosts new adds at the bottom of the page is stopping this from working. I may have to give up and just have one picture. NATPA of Nebraska's Links: Click to View or Add Links.